Igniting the masses in conflict, the emergence of cremation as a death rite has consumed the last century of American history in flames of debate and plumes of literary metaphor. Yet, with growing acceptance of cremation, the rigid boundaries of religious tradition have been transcended as gracefully as the souls that shrug the limitations of collarbones, cochleas, and the weary flesh that once held them fast. As Assistant Professor of Religion at Boston University and co-author of The Encyclopedia of American Religious History, Prothero coveys a distinct authority to this religiously relevant study, without losing the objectivity and zeal of a true historian. 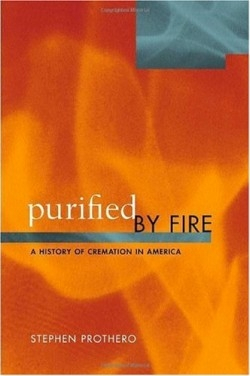 Purified by Fire, an historical account of cremation in three parts, reveals an unexpected buoyancy as Prothero pays ample attention to the wielding of metaphors and literary imagery by both cremationists and traditionalists. In hopes of bolstering the ranks of cremation supporters by condemning the grave and deifying the flame, advocates conjure bloated corpses who offer “habitat and pabulum to the universal scavengers which feed and fatten by the millions on the feculent matter.” In contrast, staunch conventionalists invoke images of the “blazing features and hands that yesterday were your soul’s delight,” in an effort to hold their sacred ground. “Why hide Reason’s, or Affection’s eyes? The grave pollutes, the furnace purifies.” These words from The Urn, a nineteenth century pro-cremation publication, epitomize the cremationist sentiments of an era characterized by sociocultural shifts—America’s Gilded Age. Clinging primarily to the pro-cremation arguments of “sanitary science,” pioneering reformers believed that traditional burials polluted physically as well as spiritually. Following the Civil War, America nurtured a preoccupation with cleanliness as a host of epidemics including cholera, typhoid, and yellow fever caused widespread panic. Focus shifted to the emission of “miasma,” the noxious fumes that were thought to seep from the decaying flesh of buried corpses spreading disease with each failing coffin lid. Audiences with interest in historical accounts, religious studies, and even those with a general taste for the macabre may be drawn to the pages of Purified, spurred on by its delicate balance of humor and scholarship. Inclusions of numerous photographs, illustrations, and woodcuts as well as a comprehensive timeline, add greatly to the appeal and balance of the book. Importantly, the book emerges as a study in personal and cultural introspection above the overt breadth of research. The product of the “alchemy” of death, Prothero finds the corpse “a powerful symbol, charged with meanings as many and varied as human cultures and individual personalities.” Here, the dichotomy of the book emerges subtly, presenting both the origin of cremation historically upon the skeletal framework of American culture and its sinewy insertion upon American death rites. Together, actively driving the diversification of American religion and culture, they shift the ashen face of death Ã fueled by flame and cradled by crucible.